how do most ppl set up equipment for this ? swivels and hooks. want to use hollow body tubes. I make my own hollow bodied tubes. I also make the jig heads that go inside them. I fish lots of brush piles and rocks so I use a weed guard. Here is a pic of one of my tubes rigged up. I normally fish them on spinning setups with 10 # mono but sometimes I use a bait caster with fluoro. Thanks, gona give it a try. 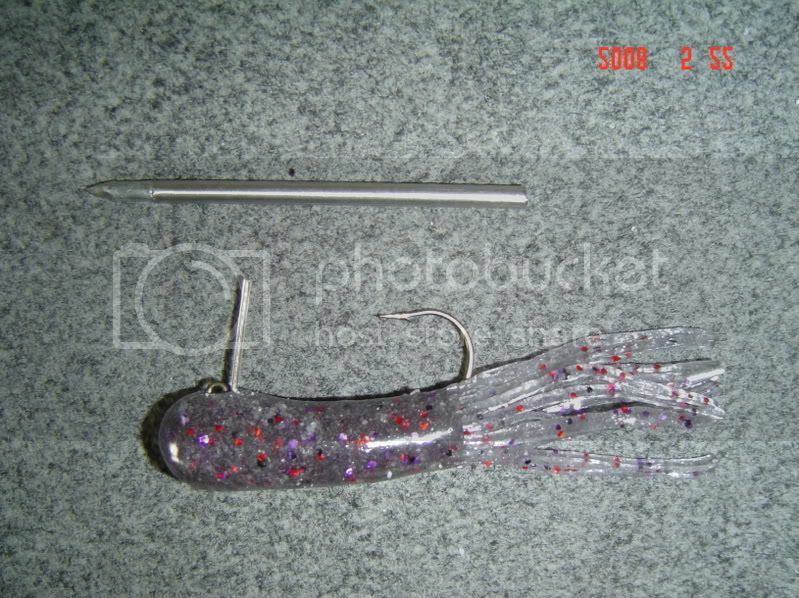 My tubes are fished on a 6'6" Carbonlite bait caster MH fast tip on a 3/0 EWG and a 3/16th slip sinker. Pegged or not depends on how much slop it goes into. The reel is a Curado 200 E7 spooled with 15lb Invizx, .013 dia. All because of the heavy grass I have to deal with. G3boats, do you use a swivel when you tube fish with bait caster OR spinning reel ? No swivel for the bait caster rig, but if you fish the tube on a spinning reel and experience it twisting your line, try rigging like a fluke. For me that is line from the reel, tiny swivel, line for swivel to hook.